Digital pianos were designed to meet the different needs of various musicians. If you’re looking for portability and functionality, then a digital piano might be the best for you. This is due to the convenient size and weight that its frame has. Furthermore, owning a digital piano can be a relief for the wallet too. It costs cheaper than an authentic grand piano. Also, it also performs similarly to a grand piano. Therefore, your sound quality isn’t sacrificed for convenience. However, not all digital pianos have great features. Some may leave you dissatisfied because of its sound. Moreover, other products may not be suitable for your tastes regarding the options it gives you. As we the Yamaha DGX 660 review, you’ll get to see the different functions that a leading brand like Yamaha offers on the table. Of course, the DGX 600 has its flaws, so that will also give you ideas on what to avoid or not. Basically, as we review one product, you’ll have a great model to compare to other products that might interest you. We’ve also listed three alternative pianos to help you in your search. Before buying, be sure that you’re aware of the important factors that make a high-quality digital piano. There are obvious ones to look at such as the sound quality, but there are overlooked areas as well. Here, we will help you by covering all the major details that should help you make a checklist of what to look at. First, let’s start with the most important area of any piano, the keys. When checking the keyboard, you want to test two things: the touch and the sound. Monitoring the quality of these two is the first step in finding the best piano for you. Since digital pianos were made to imitate an acoustic piano, you should check for similarities that it has. Usually, a digital piano is harder to play. This is because the keys are heavier and have a little twist to it. This twist is the versatility to produce different sounds in just one key. Thus, having weighted keys for your piano is improves your playing. Now, you’ll have the option to press lighter or harder. This lets you generate the right tone you’re looking for. For the sound, you should avoid choosing pianos that are too electronic when you do a hearing test. You can double check this by listening to a lot of acoustic pianos online or in person. Simply put, you want a tone that is richer and deeper. Bad-sounding keyboards usually sound flat and lifeless. “If you’re so meticulous about the sound, why not just buy a real piano?” some might say. Well, if there’s one common thing between you and other buyers, it’s the cost and size. Not everyone has the luxury to buy a grand piano. Likewise, some people have constraints at home when it comes to space. Whether you’re a skilled musician or a beginner, a digital piano helps you in more ways than one. Having a lightweight piano that comes at an affordable price is the best option for many. There’s a lot of truth to it since it’s easily sold online. With that said, make sure that the price corresponds well with the capability of the piano. Usually, a great bargain for digital pianos is right below the $500 mark. When it comes to convenience, check how big the keyboard is. Having a stand and bench bundled with the digital piano is a great option to pick. Last but not the least, a digital piano has a lot of different extras that help boost your performance. Usually, these are overlooked because buyers lack awareness. It’s important for you to understand how these can be beneficial to you. An example of this are the instruments that come with your digital piano. These are effects that enhance your playing. For example, a drum instrument feature can be present to give the sound another dimension. 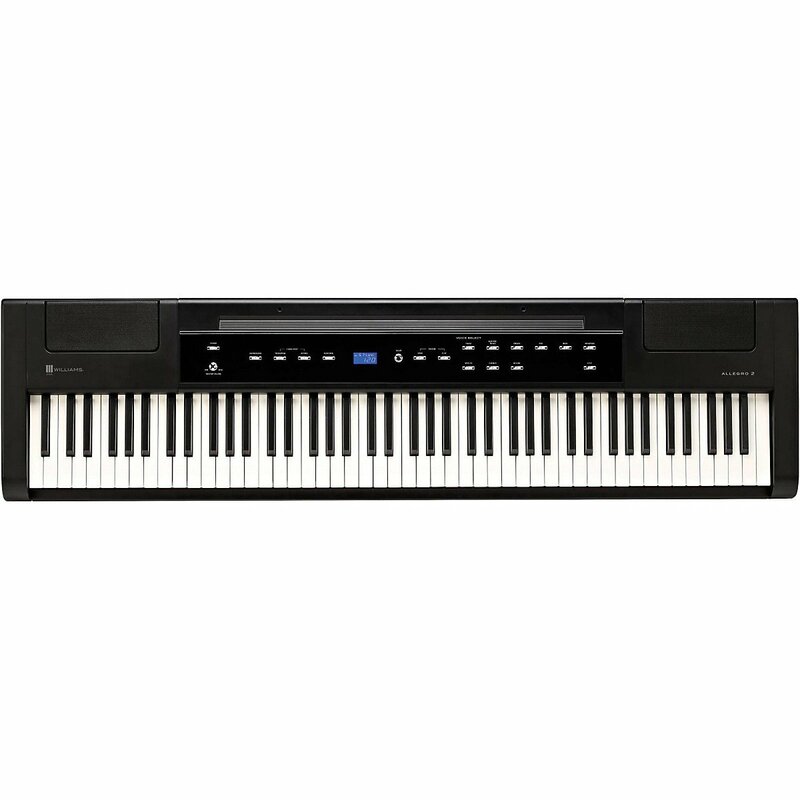 The Yamaha DGX-660 Digital Piano has 88 keys with graded hammer action. The hammer action makes the feel of Yamaha DGX’s keys similarly close to that of a real piano. This is because the keys have more resistance in the low end making them heavier to touch while the keys in the high end have less resistance making them lighter to the touch. This concept in particular directly replicates what happens to the hammers inside of a real piano as you play. Another key feature which is unique to the DGX-660 would be its Piano Room feature. This particular feature enables you to choose from a variety of pianos and acoustic settings. You can also connect the DGX-660 to a microphone. This allows you to sing as you play and hear your voice with digital effects through the built-in speakers of this digital piano. Finally, this instrument can be connected to a USB device so you can share your performance with other people. If you want to know more about other factors you should look into when buying a digital piano, check this video. You can split and layer any two voices or sounds with the “Dual” on/off button. You can experiment with the tons of possibilities of this digital piano with the Piano room feature. The bundle does not only include the digital piano itself. The piano stand that comes along with it might not be of the best quality. You might need to buy an RCA jack to mini jack adapter to use the play through headphones option. The DGX 660 comes with a pure CF sound engine. This engine is designed to imitate an acoustic piano to produce the best sounds for your digital piano. Specifically, the DGX 660’s sound is modeled to be similar to that of Yamaha’s CFIIIS concert grand piano. Combined with its high-end sound engine, Yamaha also incorporates the graded hammer standard (GHS) to its keyboard. This feature gives you the option to play different tones in one key. The keys are designed to produce different sounds depending on how you press them. If you press the key strongly on the low-end, it has a different sound compared to pushing it on the high-end. All of these are features of an acoustic piano that the DGX 660 accurately copies. Consider the sound engine and the graded standard hammer as the core features of a DGX 660. Another great feature from the DGX 660 is the score display. This feature is more on the interface rather than the fundamentals. The score display is an interactive screen that shows the music notation of your songs. With this feature, you can quickly follow the bouncing ball on the screen to guide you when playing your song. Another feature is the Piano room. This is a great feature that allows you to choose different keyboards and acoustic settings. This results in creating an ideal environment for you. Lastly, this digital piano is app-friendly. Hence, it can integrate well with other devices and mobile apps. You can use several iOS apps and connect it to your DGX 660. Among these apps are song sheets, audio recorders, calibration, and much more. The Yamaha DGX 660 has excellent tonal range. This is thanks to the built-in hardware that it boasts. Particularly, it has two 12-cm speakers to go along with an extra pair of smaller ones. These are also accompanied by two 6W amplifiers for excellent resonance. Regarding voices, this digital piano has 150 in total. Ideal for musicians who always want an extra touch of music to their performance. Sound effects and drum kits are also included in this piano. 12 voices and 6 reverbs are new for the DGX 660. So if you’re a fan of these features, you’ll be interested in checking the growing variety of effects to choose from. For more features, the Yamaha DGX 660 has a 192-polyphony attribute. This gives your digital piano that capability to play a wider range of songs. This also means you will be able to hear ALL these different notes that you’re playing, at once. It’s important to note that some products have 100 and below polyphony notes. Thus, the DGX 660 is on the better end of this feature. If you’re all about the rhythm of your piano, the DGX 660 has a unique feature for you. It has the Style Recommender that allows you to play a musical style while adding a backup band to your chords. Lastly, this product is also perfect for beginners. The Yamaha Education Suite or Y.E.S gives you a broad range of help. From tracking, timing, and tempo, it helps improve your overall playstyle. The Smart Chord and Easy Chord go with the Y.E.S feature too. These are necessary accompaniments that can be accessed with just a touch of a button. The Smart Chord is designed to follow your every move, while the EZ chord tracks the changes made to your song. Furthermore, the Intelligent Acoustic Control is another beneficial characteristic of the DGX 660. This automatically adjusts the settings for a balanced sound from your piano. For further information about the new features of the Yamaha DGX-660, here’s a video Yamaha DGX 660 review for you to watch. Most of the feedbacks you will see online would say that the Yamaha DGX-660 is good in general. It’s new Piano Room feature has garnered lots of attention and appreciation. This is most especially among those who bought this digital piano as a gift for their children. Its graded hammer action and weighted key features were also mentioned often. Comparing it to other models and brands of its price range, DGX-660’s keys prove to be very similar to that of a piano’s. This was most especially appreciated by non-beginners. Beginners trying to learn the piano in a more creative and fun way mentioned that this particular model allowed them to experiment with the music they play. Complaints were very minimal and were a minority. An example would be the piano stand that came along with the bundle, or the choice of sustain pedal which also comes along with this bundle as a set. To sum it up, the Yamaha DGX-660 is suitable for both beginners and professionals. It’s a very versatile model whose new features enable you to experiment with the music you play. Its price is also very reasonable especially when you look at all the freebies coming along with the bundle. The Privia PX350 has a unique Acoustic Intelligent Resonation System (AiR). This innovation by Casio allows this product to imitate an acoustic piano accurately. Furthermore, it has Tri-sensor hammer action keyboard. This keyboard lets you play all the four dynamics of the piano. This measures the speed and velocity at which you hit the keys. Hence, it accurately produces the sound of an acoustic piano. The Casio PX350 also comes with a damper resonance feature. This provides richer sound from the strings whenever the sustain pedal is used. The Williams Allegro 2 is a full-sized digital piano with semi-weighted keys. These keys also have a hammer-action which makes it closer to a real piano. One of the significant aspects in the Williams Allegro is the versatility you get with the sound. It offers outstanding reverbs that adds multiple effects to your performance. You can also use Modulation/FX control for selected instruments. This gives it rotary and vibrato effects that a typical digital piano wouldn’t have. The LCD also makes this keyboard easy to use. Similar to the Alesis Recital, it boasts a split and layered mode that helps ease your playing. 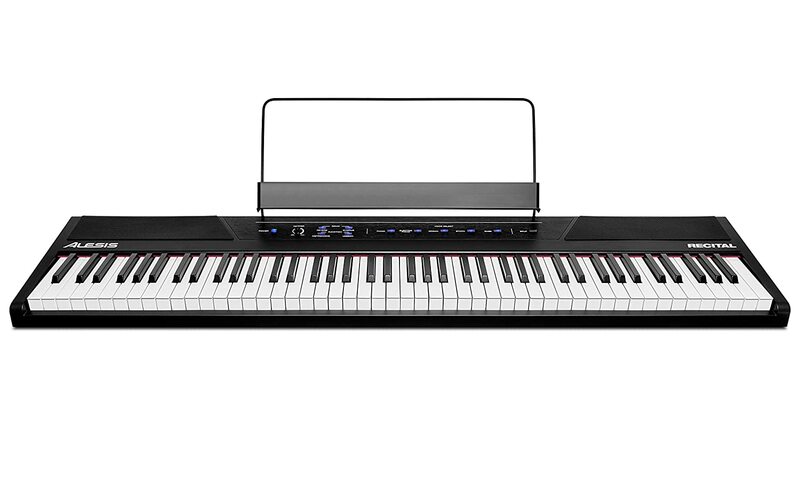 The Alesis Recital comes with 88 semi-weighted keys with powerful built-in speakers at 20W. It’s one of the best choices online for beginners because of its ease and functionality. It has powerful educational features, notably the “Lesson Mode.” This helps the mentor and student to watch each other and play together easily. This eliminates the problem of switching turns in the piano every time. The Alesis Recital also lets you combine two voices using Layer mode. This creates a richer and more distinct tone for your music. Along with this, you also have the Split mode. This mode assigns a particular function for your left and right hand. There’s no right or wrong when it comes to buying a digital piano. At the end of the day, it boils down to a matter of preference and what you’re looking for. There are many high-quality products out there. The Yamaha DGX 660 review along with the other three alternatives mentioned are all great products to buy. It can be easily seen from the review that the DGX 660 is straight to the point. It doesn’t offer many functions compared to the other products, but it has the basics of a digital piano that can make it competitive against an acoustic. Ultimately, the CF sound engine and Graded Hammer System should peak your interest if you’re looking for great sound and keyboard functionality. There aren’t many brands like Yamaha that produces pianos with great detail internally. It also boasts one of the highest polyphony notes among its competitors at a near 192. It’s not only great in sound, but it’s versatile too. Add in the app-integration interface with the educational functions; then it pretty much covers a lot of ground. It’s perfect for a musician who values the quality of tone and the functionality of the piano.